I was recently going through my copy of Houdini The Untold Story when a picture jumped out at me. It's a photograph that I have seen many many times. But it occurred to me that I didn't really know anything about this individual. Unlike my previous article on Alexander the Conjurer, this fellow did not have his photo taken with Houdini. However, Houdini did meet the man and he was important in Houdini's life for a brief period of time. His name was Henry Evans-Evanion. As I dug into his life story, I was struck by a number of things. He had a modest amount of success during his time. 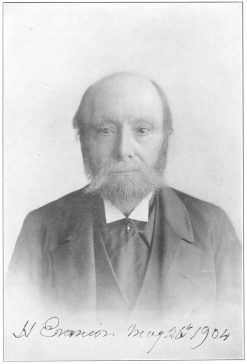 He was an avid collector of anything to do with the theatre, both magic related and theatre in general. at the Rock Inn, Kemp Town, Brighton. He used his real name Evans as his performing name. In 1857 he altered his performing name to Evan Ion, and then the following year, perhaps through a printing error went with Evanion. He legally changed his name to Evanion as well. 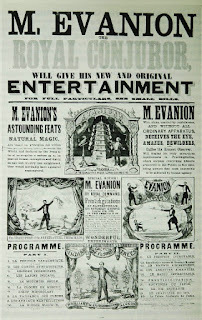 What kind of magic did Evanion perform? Well, from the illustrations used in his advertising posters I can see he did a verison of the Robert-Houdin Suspension which was copied by pretty much every working performer of that time. He presented the Inexhaustible Bottle which was another popular trick from that period. 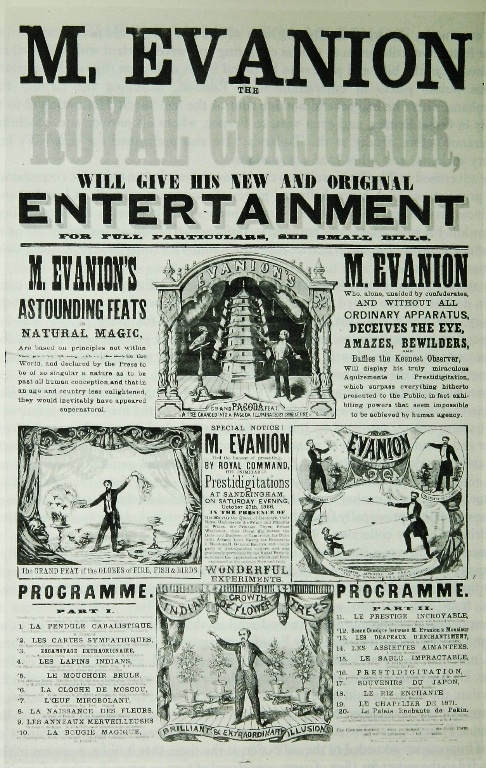 Evanion presented the production of bowls of water very likely with goldfish, a production of numerous items from a top hat, The Flags of All Nations, Production of a Firebowl, and the Growth of Flower Trees illusion. In an article by James Hagy in, The Perennial Mystics No 18 page 2.9 is states, "Evanion's performances continued to feature not only conjuring but ventiloquism, an art which gave center stage to elaborate patter and wit which was reputed to have been Evanion's pride." I do not profess to be an authority on Ventriloquism, far from it. But I get the impression that what we think of as Ventriloquism today and what was presented in the Victorian era are two different things. That is to say, I don't think they were using Vent Dummies or puppets the kind that we are familiar with. Rather, the concept of 'throwing your voice' or making it appear your voice is off in the distance is what they likely were doing along with comedic scripts. On the surface there doesn't appear to be anything remarkable about his show. Not to say it was a bad show, it's just very much like the programs that the other players of that time were doing. He did perform for royalty, the Prince and Princess of Wales. So that was a huge feather in his cap that he could brag about. In fact, he billed himself as The Royal Conjurer. And this royal conjurer appears to have performed right up until shortly before his death. His last recorded performance was in 1905 for a school party in the English countryside. The Annals of Conjuring does point out that his fee at this later date was a pittance compared to what he received in his heyday. 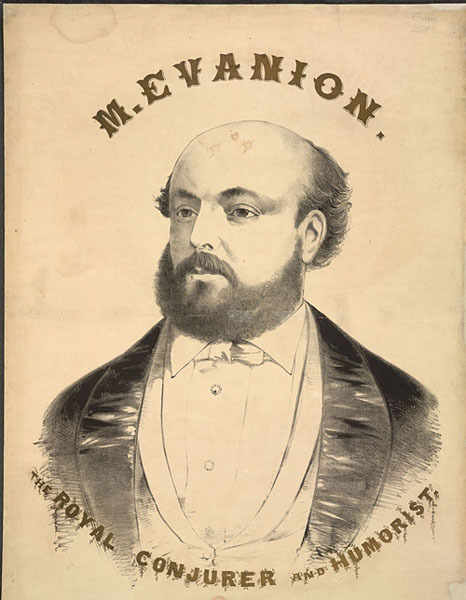 The remarkable thing about Evanion appears to be his collection of theatrical handbills and assorted ephemera. He had a huge collection of both magic and none magic theatrical papers. He very well may have been one of the first to ever collect such things. I've read in multiple sources that his collection may have been more because he could never throw anything away. However, in The Sphinx Magazine Vol 48 #11, it says "Evanion would miss a meal in order to purchase a programme or booklet. He was also known to buy a dozen, at least, of the same periodical in which there appeared an article on conjuring." I'd say he was a true collector. In 1904 Houdini comes into the picture. Houdini was performing at the London Hippodrome and had come down with the grippe (the flu). He had been confined to his room by a doctor but did do a newspaper interview. 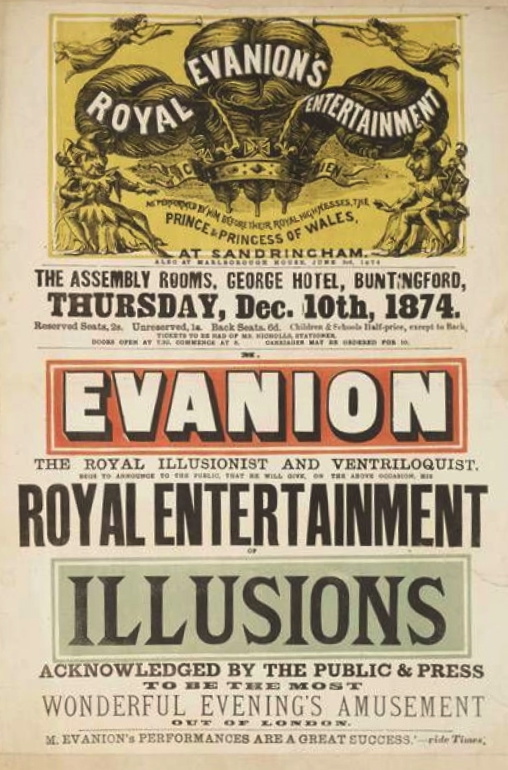 The reporter mentioned the collection of handbills and clippings that Houdini had been acquiring for an upcoming book on the history of magic. The article that appeared in the paper mentioned Houdini's collection and this caught the eye of Henry Evanion. The 72 year old conjurer proceeded to contact Houdini at his hotel on the same day the article appeared in the paper. He very likely went straight to the hotel. Houdini agreed to meet him the following day. The next day Houdini waited for the elder magician but he did not show. Later in the day Houdini decided to take a short walk. As he exited the elevator, the porter told Houdini that some old guy had been waiting in the lobby. Since early in the afternoon this man had been waiting but the hotel staff did not tell Houdini given 'the shabby appearance' of the old man. All of this comes from Houdini's book The Unmasking of Robert-Houdin. Houdini says that he spoke to the old man who had a parcel of old clippings and playbills to show Houdini. And here is where it gets truly interesting, in Houdini's own words..."I remember only raising my hands before my eyes as if I had been dazzled by a sudden shower of diamonds." This was Houdini's reaction to seeing first hand, playbills belonging to Robert-Houdin, Phillippe, Katterfelto, Pinetti, Breslaw, Anderson and others. He completes the description with this, "I felt as if the King of England stood before me and I must do him homage." This really speaks to Houdini's love of magic and magic history. 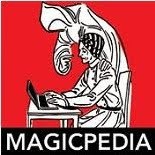 It's a terrible shame that his book on magic history turned into an attack on Robert-Houdin because it could have been one of the greatest books ever written. But back to the story. The next day, Houdini, against the advice of Doctors, takes a cab to Evanion's home. Remember, Houdini had a bad case of the flu, but he was so engrossed in this world of magic history that he and Evanion lost track of time. It wasn't until an angry Theo Hardeen and Houdini's Doctor showed up at 3:30 a.m. the next morning looking for Houdini, did he (Houdini) realize the time. They practically had to drag him out of there, not because he was too ill to walk but because Houdini was having such a great time. Over time Houdini would purchase more and more of the collection. On June 7th, 1905, Houdini went to visit Evanion one final time, this time at the Lamberth Infirmary. Evanion was suffering from cancer of the throat and could hardly talk. Ten days later, Evanion died. Houdini helped with the funeral arrangements and set up a fund to help Evanion's ailing wife. Much is made in the magic press of Houdini's ego, but not much is made of his kindness. This is a great example of Houdini's generosity. Houdini did not get the entire Evanion collection, though he did get quite a bit of it. Evanion himself had been periodically selling off pieces of it even before he met Houdini. And a big section of the collection dealing with Victorian Theatre went to the British Library where it still resides today. 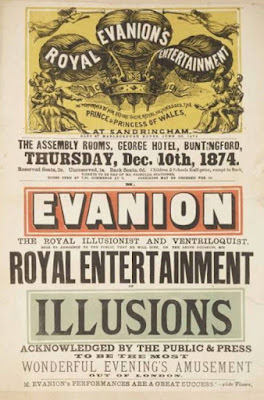 I think Houdini, by writing of his visits to Evanion, did secure a place for the old Victorian magician in the annals of magic history! * If you head over the WildaboutHoudini.com you can see some images of Evanion's home as it looks today! Great post Dean! It never hurts to be associated with somebody really famous to get your name in the history books. 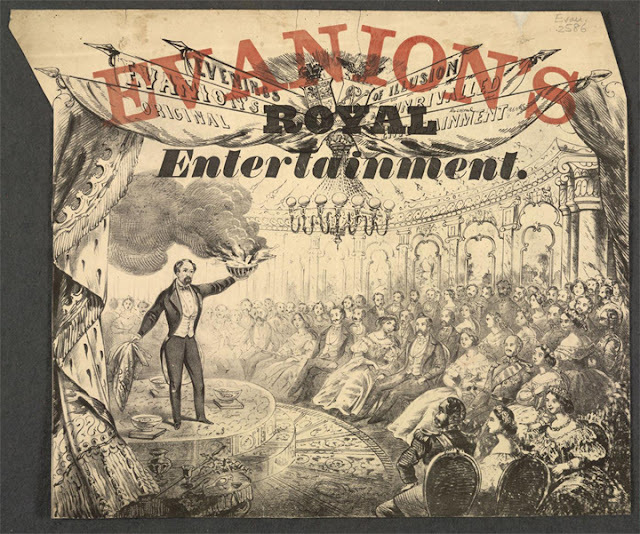 I believe Houdini's purchases of Evanion's materials became the central core of his growing magic and theater collection at 278. When you look at Evanion's stage repertoire, it all looks like familiar 19th century stage conjuring: Goldfish bowls, flags, growing trees, and top hat productions. With an act like that, you aren't really going to stand out from the crowd. It appears from the various articles I read that his standout material was his ventriloquism. And yes I agree, nothing unique to make him stand out from everyone else. A lesson that modern day magicians still have failed to understand for the most part. Thank you for investigating this man further. 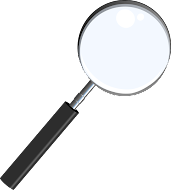 Did you happen to find his wife's name in your research? I'm still trying to confirm if this is the Henry I am looking for!